The Fitbit (NYSE: FIT) stock price climbed 5.9% today (Monday), hitting an all-time high of $44.59 a share. With today's gain, Fitbit Inc. (NYSE: FIT) has become one of the best-performing IPOs of the year. On its June 18 debut, the fitness-related wearable tech company raised $732 million by selling 36.6 million shares at $20 each. Fitbit stock saw a first-day return of 48.4% and gained 63% by the end of its first week. Since then, the Fitbit (NYSE: FIT) stock price has seen a total return of 111%. According to Renaissance Capital, a manager of IPO-focused ETFs, that places it fourth behind Seres Therapeutics Inc. (Nasdaq: MCRB), Shake Shack Inc. (NYSE: SHAK), and Spark Therapeutics Inc. (Nasdaq: ONCE), consecutively. Wall Street is extremely bullish on the Fitbit stock price. In fact, seven investment banks gave Fitbit stock a "Buy" rating this morning alone. These firms include Stifel Financial Corp. (NYSE: SF), Deutsche Bank AG (USA) (NYSE: DB), Piper Jaffray Companies (NYSE: PJC), SunTrust Banks Inc. (NYSE: STI), Barclays Plc. (NYSE ADR: BCS), Morgan Stanley (NYSE: MS), and William Blair & Co. The two banks with the highest price targets are Stifel and Piper Jaffray. 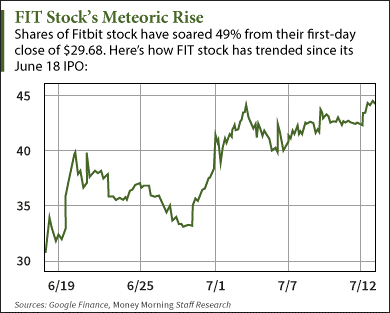 According to Bloomberg, Stifel gave the Fitbit (NYSE: FIT) stock price a target of $57 a share. That would be a gain of 27.8% from today's high. The firm cited multiple avenues for growth, including new products, international market penetration, and ad revenue potential. Meanwhile, Piper Jaffray gave FIT stock a target price of $52. The bank expressed optimism in Fitbit's ability to beat any newcomers to the fitness wearable tech market. "While there is a rising tide of competition, we believe the two most attractive characteristics of the company are the (1) strength of the brand, and (2) the accessibility of the brand across multiple ages, incomes, and geographies," Bloomberg reported. Many of these banks take advantage of these newly issued stocks by purposefully inflating their price in order to make quick profits. "The IPO process is now a rigged game – one in which the founders, the early angel investors, venture capitalists, and the investment bankers all make out like bandits," explained Money Morning Chief Investment Strategist Keith Fitz-Gerald. "They don't give a rat's you-know-what about whether you make money." Despite the unfair IPO investing process, retail investors like you and me can still turn a profit from these hot new stocks. Don't miss a single Fitbit (NYSE: FIT) stock price update – follow me on Twitter at @AlexMcGuire92.